The first fully integrated cloud solution for preclinical CROs. From subject management and data collection to discovery. The first end-to-end research platform for preclinical CROs. Store all your data in one place - from raw data to finished analyses and everything in between. Every version of a dataset is saved and tagged with its collection and analysis settings, so the entire experimental process is tracked, accountable, and repeatable. GLP is easier than ever. Our Bridge technology connects your existing lab equipment to the cloud, enabling remote control of experiments and real-time data streaming directly into your account. This makes it easy to collect and analyze multi-dimensional data in parallel for high-throughput studies. We provide built-in analysis and visualization tools for all compatible data sources, including photobeam activity systems, video-based activity tracking, and manual behavioral coding. Invite collaborators to view, comment, or contribute to an experiment. You always control your data and manage permissions. Now it's easier than ever for managers to oversee progress, assign responsibilities, and transfer projects from one team member to another. Never worry about losing data when everything is safe and backed-up on the cloud. We follow the strictest industry security standards to protect your data. Information security studies show data is safer on the cloud than stored locally. Everything you need to run your experiments. Everything you want to make it simpler. Connect all your instruments to stream data in real-time directly into your account. Run experiments from either your phone or desktop so you can efficiently start trials in person or remotely. Run as many simultaneous subjects as you like. BehaviorCloud lets you utilize as many data streams as you have available. Invite collaborators and manage permissions to move your project along more efficiently. Analysis tools supporting a diverse range of applications. Analyze and export everything from within your BehaviorCloud account. We give you free cloud data storage included in your subscription. Keep your data at your fingertips, always accessible anywhere there is internet access. We improve productivity at every level of your organization. We make running experiments more convenient by providing a central, mobile-friendly platform for controlling instrument settings, running trials, and collecting / analyzing data. The only truly end-to-end cloud solution for life sciences researchers. 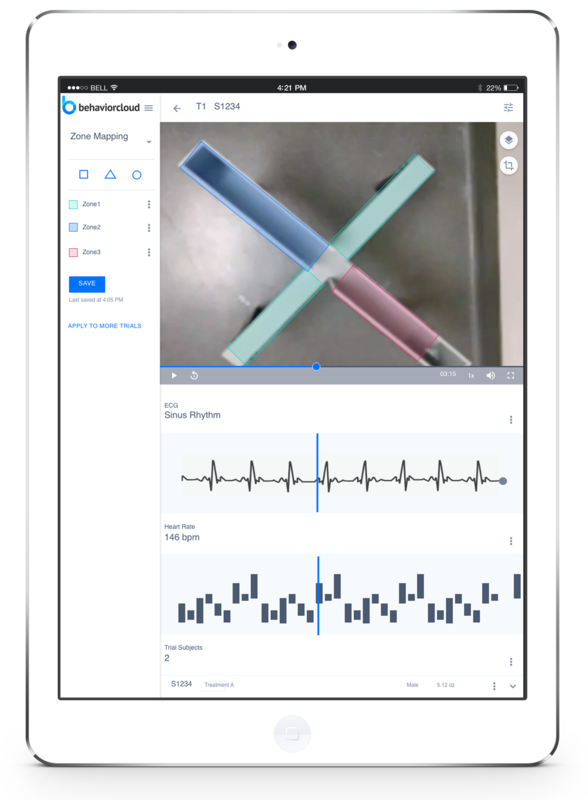 Now it's easy to oversee experiments performed by your laboratory staff, annotate and comment on data files, and facilitate collaboration within or outside your team. When staff members leave, it's easy to transfer experiments and maintain records of all work that's been done. We make it easier for CROs to share progress with their clients, allow oversight into the testing process, and receive results in real-time. 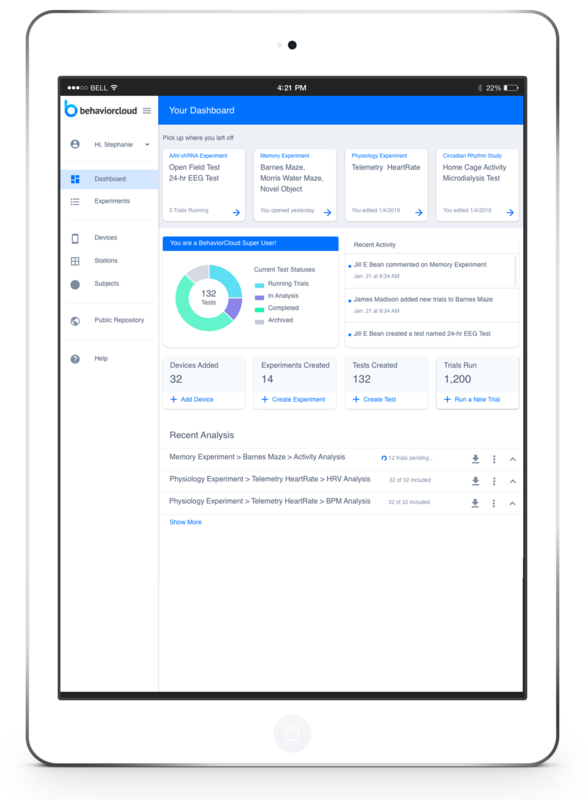 Generate comprehensive reports directly in the platform so your clients have all the information they need.